There are some tools you want to own, but rarely want to use. 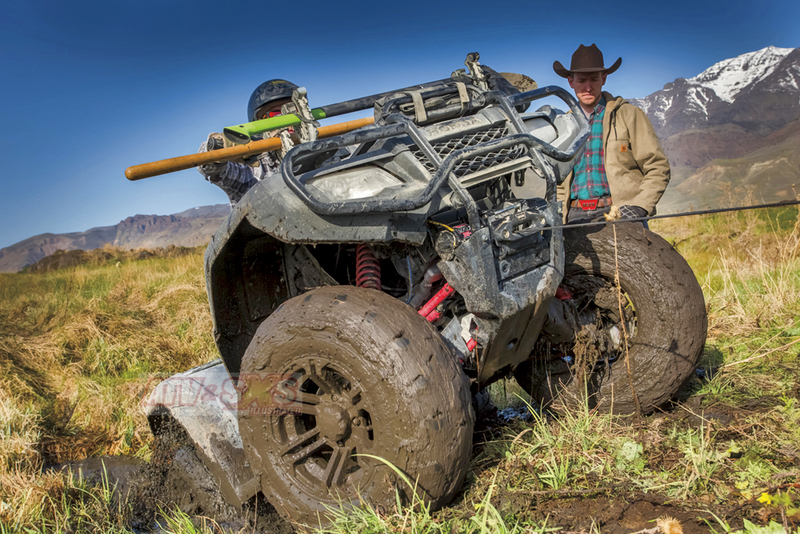 A winch is one such tool, and when standing knee deep in the muck while your friends laugh from the sidelines, it’s not only a mechanical wonder, but also your new best friend. You tend to be a little more brave when the red badge of WARN is stuck to the front of your machine. 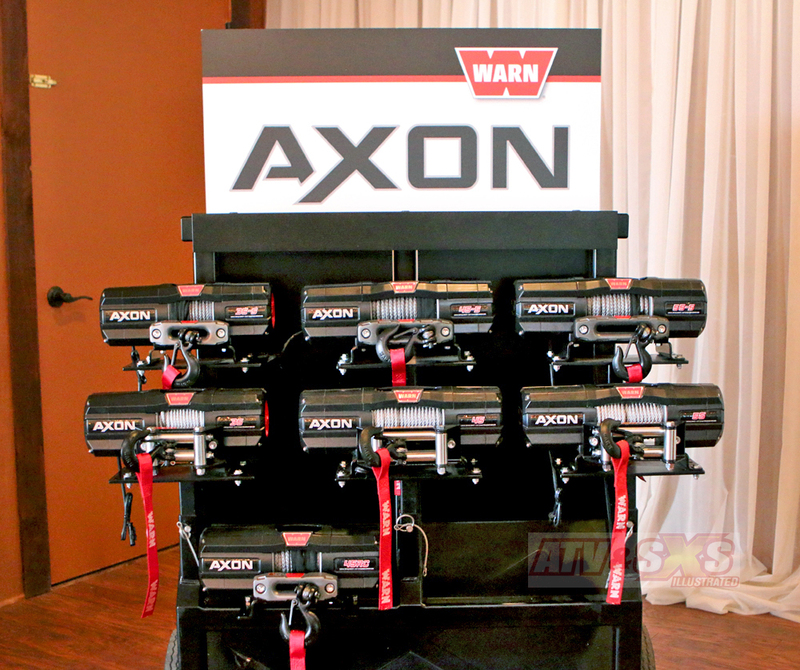 WARN products have been plucking people out of sticky situations for more than 70 years thanks to their continually evolving, premium quality winches, the most recent being a new lineup for the powersports world called the AXON line. 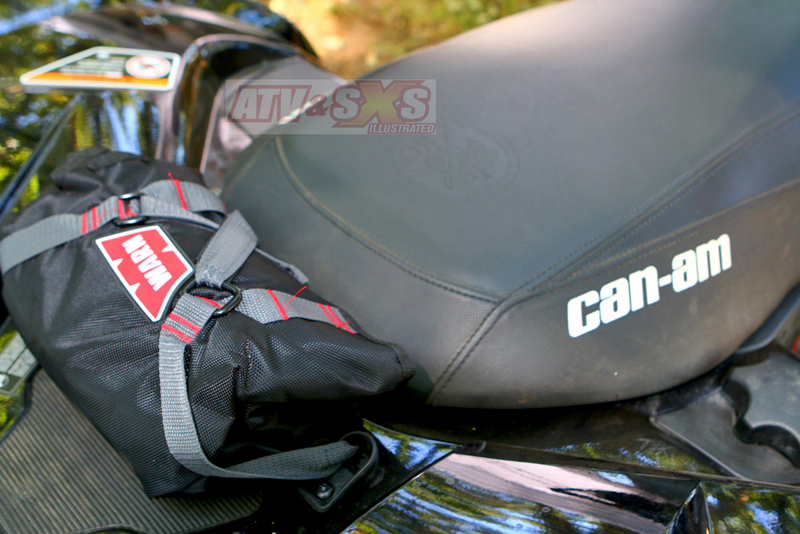 They’re compact, powerful, easy to install, and can save your weekend adventure. 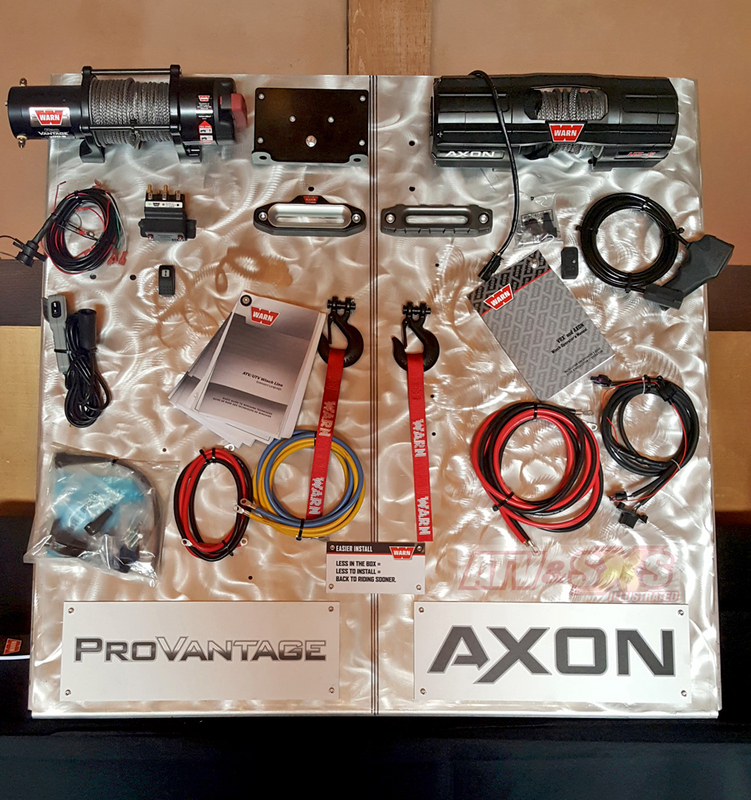 Today the powersports market is a very important segment for Warn, and everything they’ve learned through three decades of winch making is incorporated into the new AXON lineup. Completely sealed electrical system. 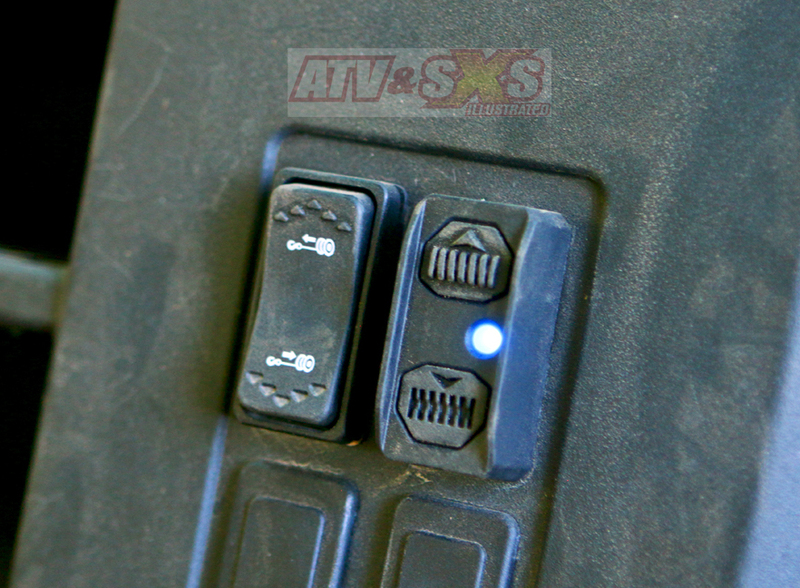 Warn calls the combination electrical contactors and motor a MOTACTOR. Much fewer connections for installation. Warns MOTACTOR is really the heart of the new AXON winch line. The Motactor is a revolutionary digital combination of the electrical contactors and the winch motor. What it offers is increased performance with more efficient use of the electrical system, MUCH simpler installation since there are far fewer connections to be made, and it even offers feedback to the user. 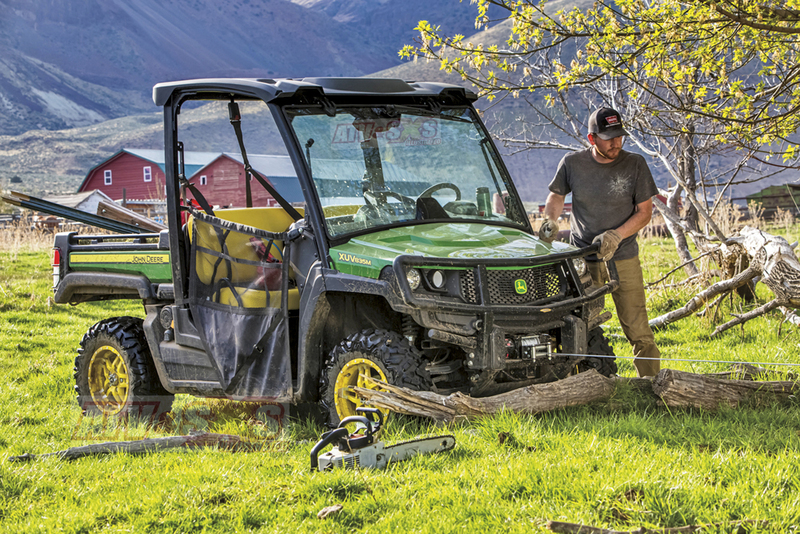 It lets you know when it is in the sweet spot for winching, and when it’s getting a little warm so you can back off for a minute. And it is fully waterproof. 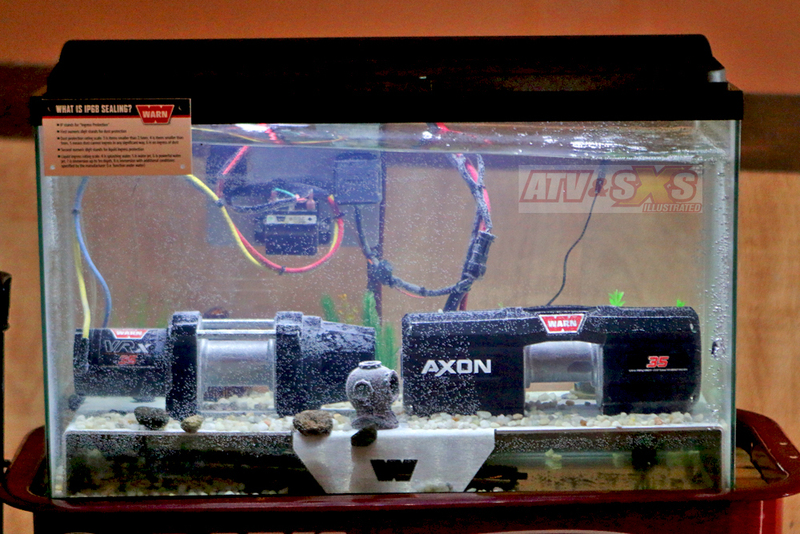 Just to prove that point, WARN had one operating in an aquarium. Development wasn’t just limited to the electrical system however. AXON 35 The base winch for most ATVs - 50’ of 7/32” steel rope, roller fairlead, Rockerbar digital control switch with handlebar mount adaptor. 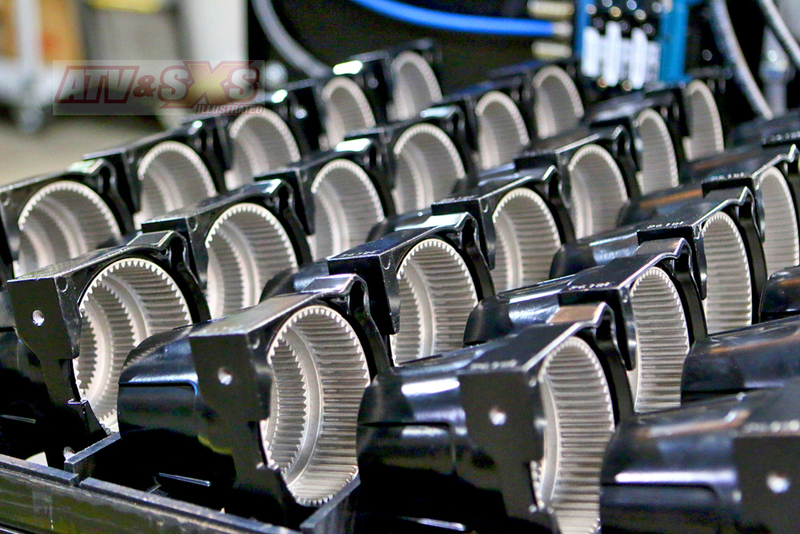 Warns secondary lineup of powersports winches offers first rate quality. 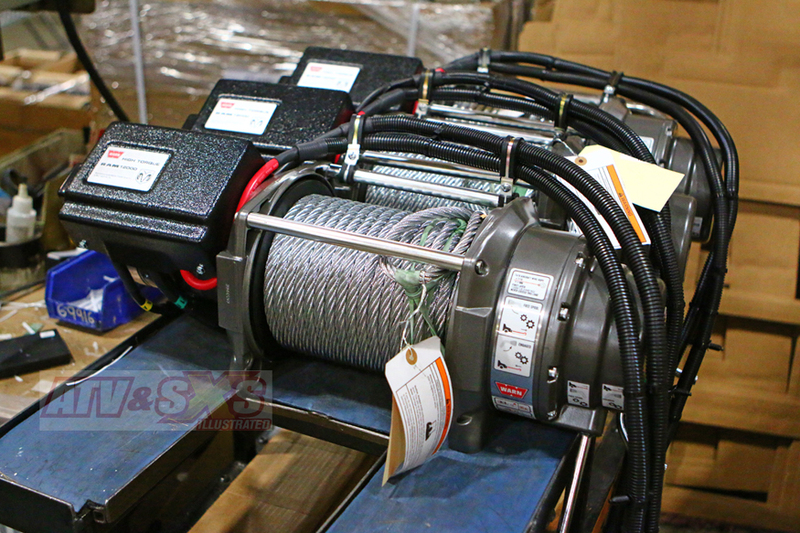 Called the VRX lineup, these winches are based on the premium quality Pro-Vantage winches but with new upgrades. Features include a powerful permanent magnet motor, a smooth, reliable, three-stage planetary gear train and metal gear housing, an all-new clutch design, and full sealing to keep out dirt and water. A patented roller disc brake provides excellent control, and all parts are coated or plated for corrosion protection, including the hooks. They also come with a limited lifetime warranty on winch mechanical parts and a three year warranty on electrical parts. VRX winches are available in 2,500, 3,500, and 4,500 lb. capacities, and can be upgraded with synthetic rope and different fairleads. There’s a lot to like about the Warn winches, but it doesn’t take long to discover one of their best features long before you leave the shop. They fit well! 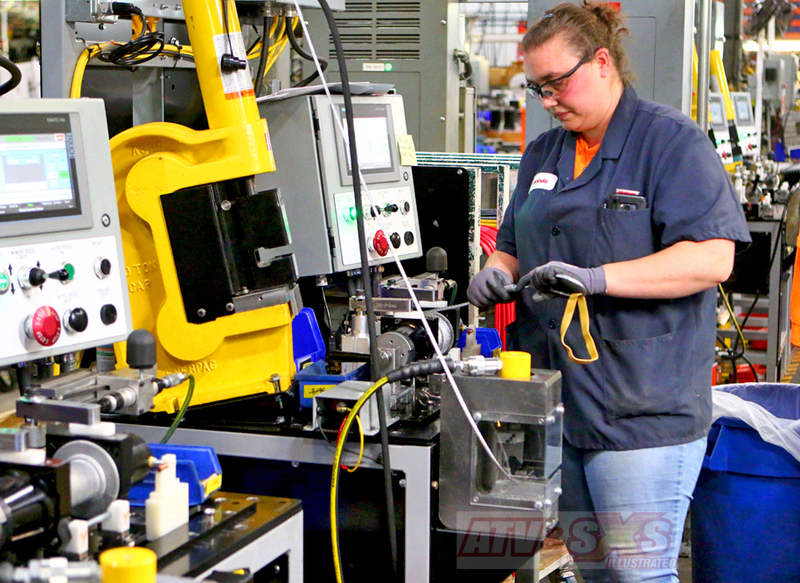 We really like how there is no cutting, drilling, welding, or bending required for installation, and Warn designs their winches and mounting kits to bolt directly on your vehicles chassis. It also insures the force from pulling is distributed evenly across the chassis. Warn fully tests their kits to insure the winch is capable of everything they say because when you need a winch, it’s the wrong time to discover the product you’re counting on can’t get the job done. Besides their awesome lineup of winches Warn also builds accessories for your vehicle, with bumpers, mounting kits, and even snow plows. 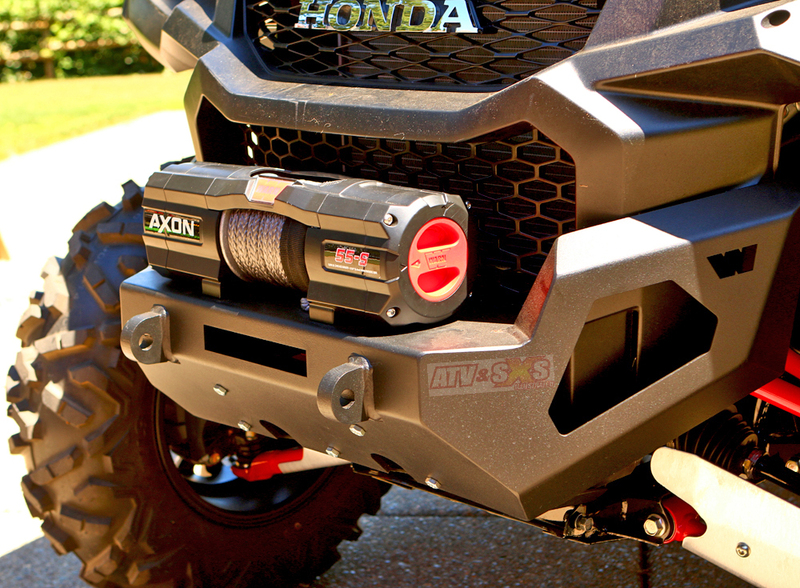 Thanks to their considerable manufacturing capabilities, all of the Warn Side x Side and ATV accessories are laser cut, formed, welded, and then powder coated in-house for complete quality control. And by quality we mean it will fit with no cutting, bending, or welding on your end, and it will hold up to all the abuse you can give it. We really like the style and durability of the Warn bumpers and mounting plates. The steel material is thick enough to hold up to abuse, and stiffening ribs and corner gussets are used to further enhance durability. A tough, wrinkle-black powder coat finish provides corrosion protection. If you hit something and screw up this bumper you’ve got real problems! 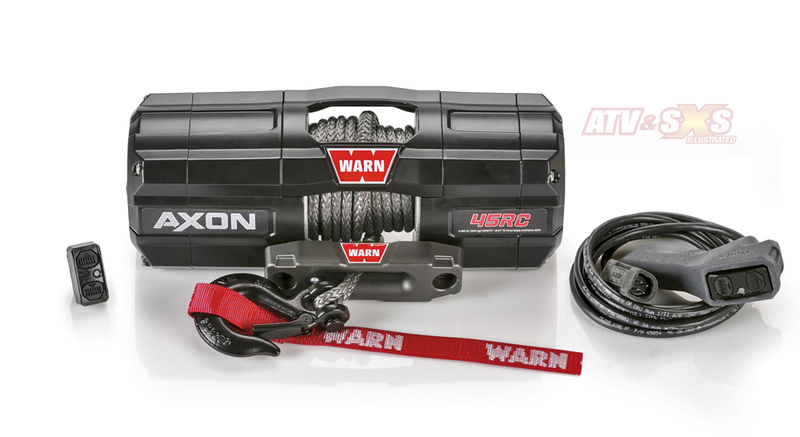 As expected, all the Warn products are made to easily accept a winch as well. Warn snowplows have been pushing back at Mother Nature for years, and we’ve even used one to move loose gravel on a drive building project. It sure beats shoveling, and it too has been a great performer. About 10 minutes after the first ATV was introduced, no doubt somebody decided to see just how much mud, water, and rocks it could cross. Warn was already waiting for the inevitable outcome. With the introduction of the new AXON line they are still there for you, only this time with a far better tool for the job. When you’re in deep it’s the tool to own. Go ahead; tempt fate, test friends, but trust Warn! When you really need a winch, you literally are between a rock and a hard place, or up the creek without a paddle. There is more to using a winch than reeling out the cable and dragging yourself out of a jam though. 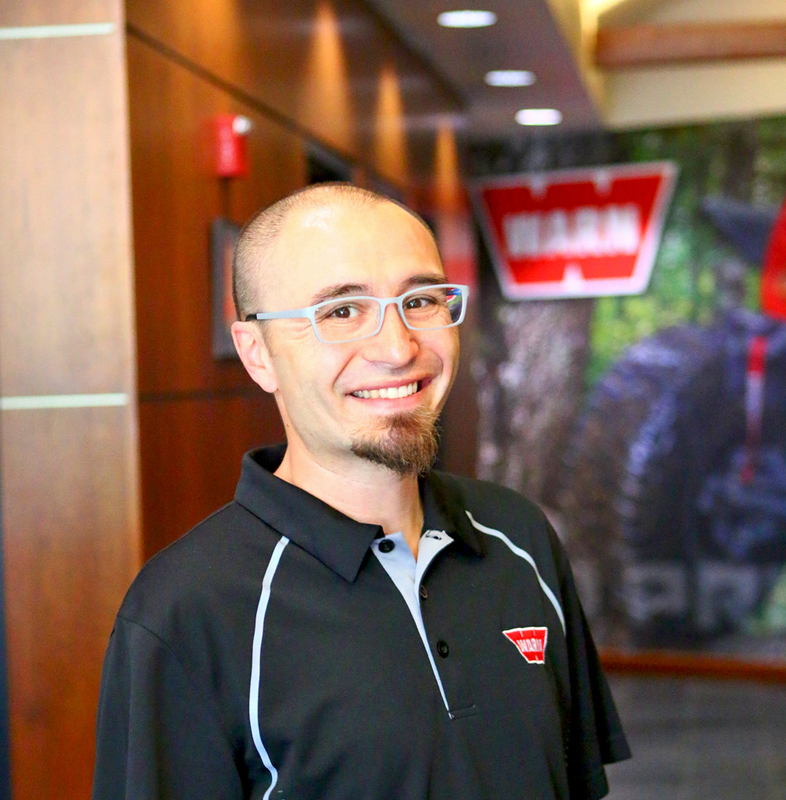 WARN gave us a few tips on how to winch yourself out safely. 1. NEVER wind the winch rope or cable around the anchor point and hook back onto itself. Instead, ALWAYS use a nylon sling or strap around the tree or anchor point to avoid damaging your rope or the tree. 2. KEEP THE ENGINE RUNNING. When winching, keep the motor running on the unit being pulled. 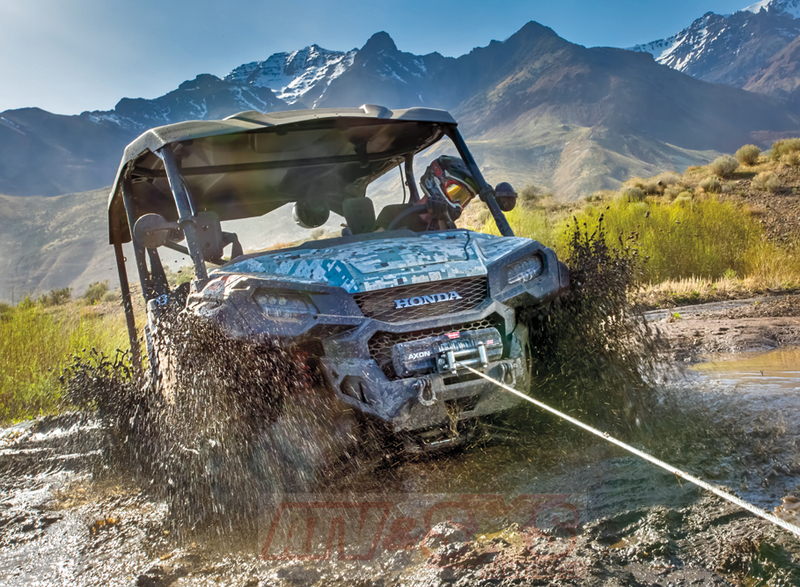 Winch motors draw a lot of amps and it’s not going to do you any good to winch your ATV or UTV from the mud, only to be stuck on the trail with a battery that now won’t crank over the engine. 3. Use a WINCH SAVER. A winch saver is a little rubber donut that slides over the cable and helps prevent the hook from banging around on the fairleads, and helps protect the rope from any sharp edges on the hook. 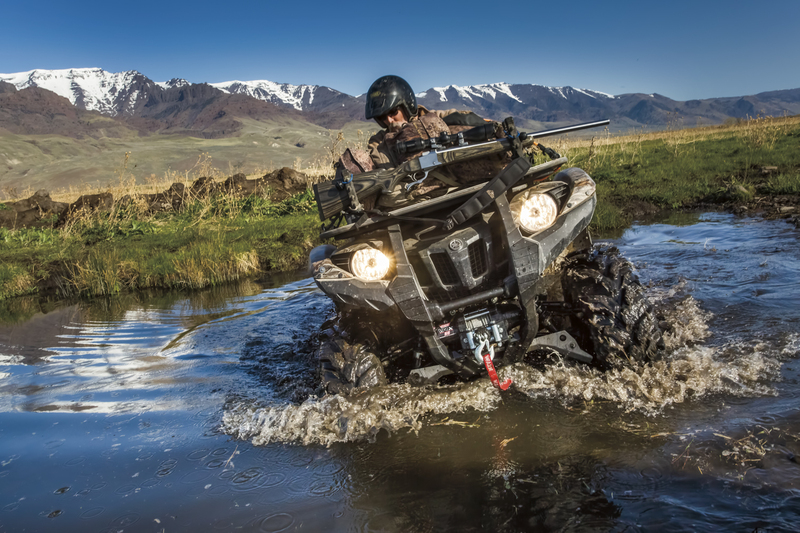 Make sure your fairleads work freely and aren’t stuck or packed with mud. 4. When plowing snow, use only a short piece of synthetic rope. This will help reduce wear on your longer and more expensive line, and it will help eliminate the rope from becoming tangled (bird nesting). Also, only lift the plow up to clear the obstacle or back up, but don’t continually run it against the maximum heights stops. Continually lifting to the stops stresses both the rope and the winch. 5. After operating in deep mud or water, reel the rope or cable out and wash it off, along with the winch itself. Dirt, mud, and grit will definitely shorten the life of your winch. If you have steel cable, spray down with WD-40 to remove the water and help prevent corrosion.